(Download a High Resolution PDF here)Note: This page will be updated frequently with new information! 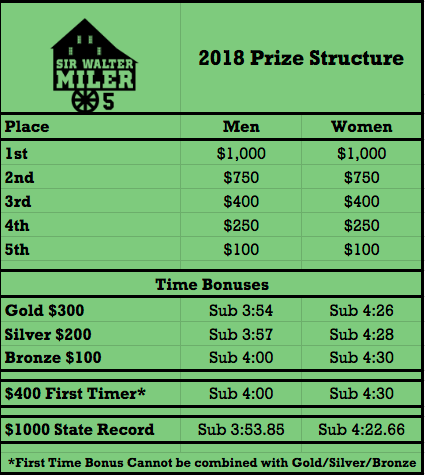 The 2018 Sir Walter Miler will once again take place at the Meredith College track, with the Pre and Post race party happening at Raleigh Brewing Company, starting at 6pm. 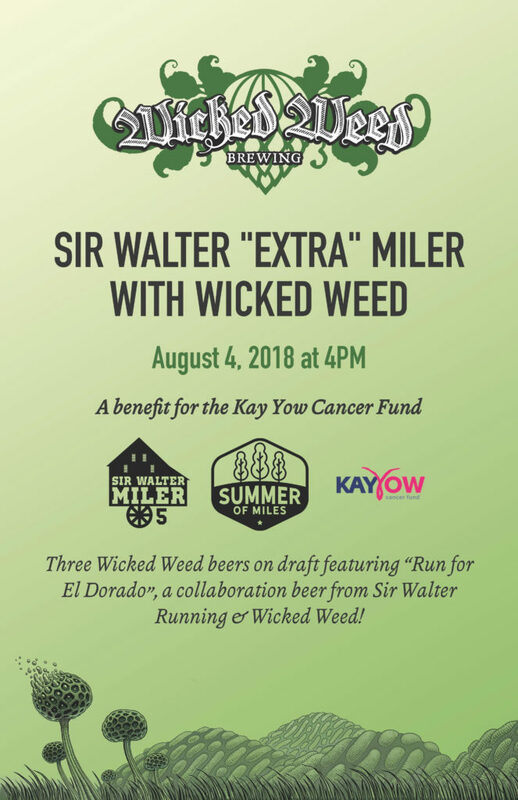 Wicked Weed (Run for El Dorado Pale Ale) and Raleigh Brewing (Sir Sandman Kolsch) will have exclusive runner-friendly beers on tap to raise money for the Kay Yow Cancer Fund, and Bo’s Kitchen, Arepa Culture, and Webby’s Shaved Ice food trucks will be in the Raleigh Brewing parking lot! We have our best field yet in 2018! 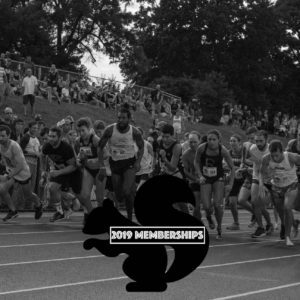 Get to know the athletes! 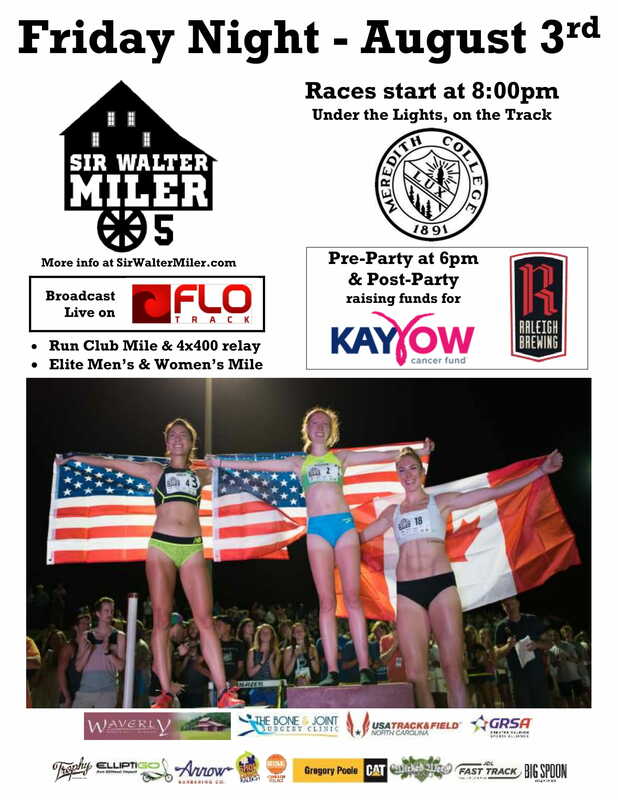 If you aren’t going to be in Raleigh, please check it out the event live on FloTrack Pro. Meredith College – If you park here, enter through the Faircloth Street lot. You can park anywhere on campus, but not on the grass (Campus Map). Some light rain may postpone a “ball” game, but this can be beneficial to runners. 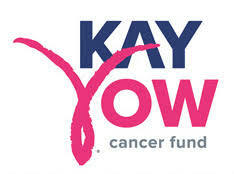 We will have 6 porta potties (2 more than last year) behind the field house on the hill. Please refrain from using the field house bathrooms, as they are for the elite athletes. Rise – Cameron Village has donated biscuits, donuts, and coffee! 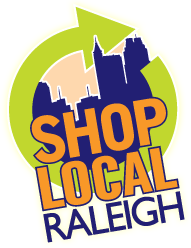 ElliptiGO will be on hand for demos as well!